Image by gajman on flickr. Professor Tom Kompas is Director of the Crawford School of Public Policy. He is also the Foundation Director of the Australian Centre for Biosecurity and Environmental Economics (AC BEE). He currently teaches the course Masters Microeconomics (IDEC8064). How can we ensure there is sufficient food for all? And why does climate change policy sometimes come into conflict with food policy? 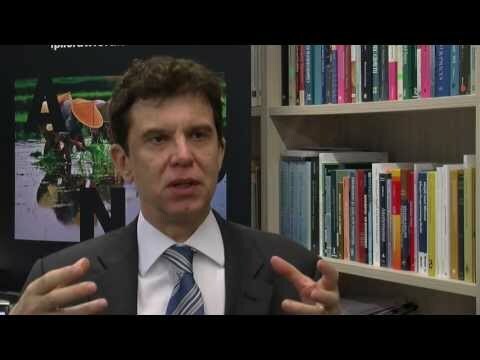 Professor Tom Kompas, Director of the ANU Crawford School of Public Policy, sheds some light on those questions as he discusses the new Food Policy Institute. Good policy doesn’t just mean it’s clear, easy to understand and straightforward to implement. It can also mean the difference between life and death. Take food policy; get it wrong, export industries can collapse, crops can rot in the ground and people can starve. Our supermarket shelves may be stacked high, but in our region these concerns are never far from the surface. In 2008, while the affluent West reeled from the Global Financial Crisis, in many of the world’s developing nations another crisis was unfolding - the Global Rice Crisis. In Vietnam, the rice bowl of the world, the government - fearing a poor crop and aiming to protect people from the effects rising oil prices - banned export sales of rice. The effects were devastating. Throughout Vietnam people, fearing shortages, began hoarding rice. Prices quickly doubled, stock was emptied from the shelves and farmers lost countless millions from not being able to sell their products into lucrative overseas markets. “This is in Vietnam - the world’s biggest rice factory where there is plenty enough rice for everyone, more than enough to go around. It’s an example of bad food policy,” says Professor Tom Kompas, Director of Crawford School and the newly-formed Food Policy Institute. Kompas was in Hanoi during the 2008 Global Rice Crisis. What he saw there left a permanent impression about the importance of getting food policy right. Moreover, he thinks that right now, another piece of poor food policy is having unintended effects - the production of biofuels. “In the last five years there has been a big move in the USA to use soy and other kinds of food for energy - biofuels,” says Kompas. “It sounds like the right idea - let’s use all of this corn and soy beans that we grow, turn it into ethanol and use that as an energy source so that we use less oil; there’s less carbon dioxide from oil, and we’re using a home-grown product. Kompas calls this a Green Paradox, where well-meaning policy has an unintended and undesirable effect elsewhere. The answer, he says, is to avoid it in the first place by not using basic foods for energy. But the Green Paradox highlights another significant issue - that food policy sometimes come into conflict with climate change policy. It’s a conflict he hopes the formation of the Food Policy Institute can help to address. The Institute - officially launched at ANU Public Policy 2013 by Senator the Hon Joe Ludwig, Minister for Agriculture, Fisheries and Forestry - aims to bring together researchers working in food policy with researchers working in climate change, the environment and energy. “The Institute has two roles,” says Kompas. “First, it’s an umbrella organisation that captures existing centres within the School and brings them together to form nice synergies and new ways of connecting together. So that includes the Australian Centre for Biosecurity and Environmental Economics, the Centre for Water Economics and Policy, and the Centre for Climate Economics and Policy. Food can’t be disconnected from water, energy, climate change and natural resources, so those centres will come together at the Food Policy Institute to focus on food. For Kompas, applying academic expertise to the issue of ensuring that people have sufficient food on their plates is the most important role that the Food Policy Institute hopes to play. “Food is one of the major challenges facing society. We need to have a stable food supply system to make sure we can feed everyone. “We want to study ways to guarantee we have an adequate food supply and that there is stability in the provision of food. That’s an issue tied to poverty. Some of the poorest people in the world are the ones who don’t adequate supplies of food. “So good food policy should look at all of these things - the things that we care about in terms of providing the essentials for alleviating poverty, thinking about development and also looking at what policies might be put in place to ensure that we have stable food supplies.